I’m always searching for new ways to make potatoes. As much as I love them roasted and mashed it can get a bit boring. 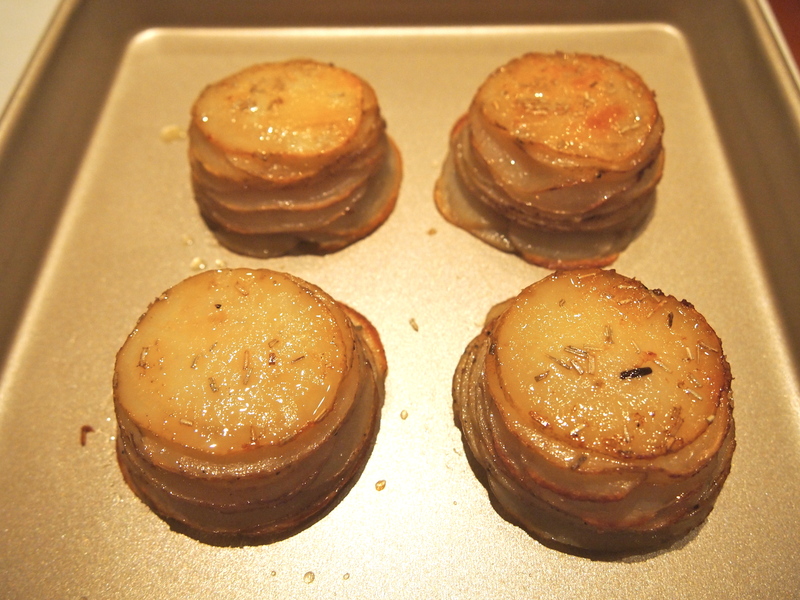 Pommes Anna is a traditional French side dish of potatoes which have been very thinly sliced, coated in butter and then neatly layered in a skillet where they are first cooked on the stove top and then transferred to the oven to finish off. 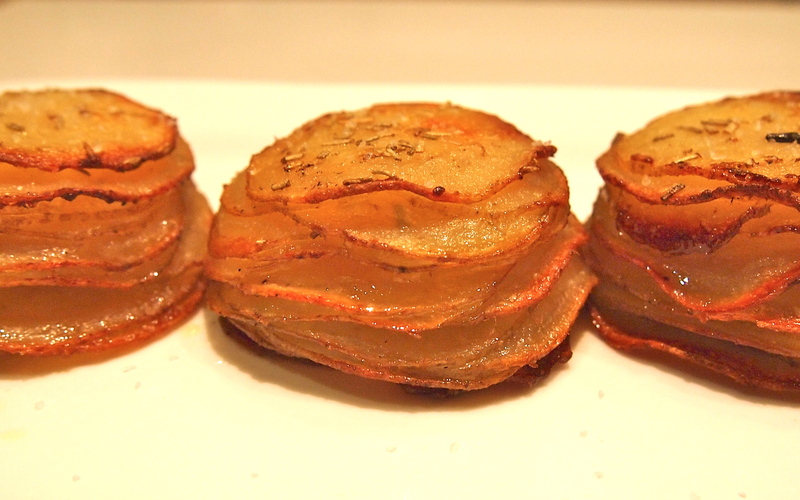 The final dish is carefully inverted onto a serving plate – the appearance being that of a cake made of golden potatoes with a crisp top and bottom and perfectly cooked potatoes in the middle. It’s very delicious. These mini ones are a take on the classic but I think they’re easier to prepare and they look fabulous plated individually. This recipe is great if you’re entertaining as the potatoes can be prepared and roasted ahead of time and then finished off again in the oven just before serving. I recommend using slightly waxy potatoes as they’ll hold their shape better and a mandolin is by far the easiest way to get the potatoes very thinly and evenly sliced. I make these in a muffin tin, so they’re not that big and you’ll need at least two per serve, but safer to count on three per person. The good news is that because the potatoes are so thinly sliced there’s roughly the equivalent of only one potato per serving! Pre-heat oven to 200C. 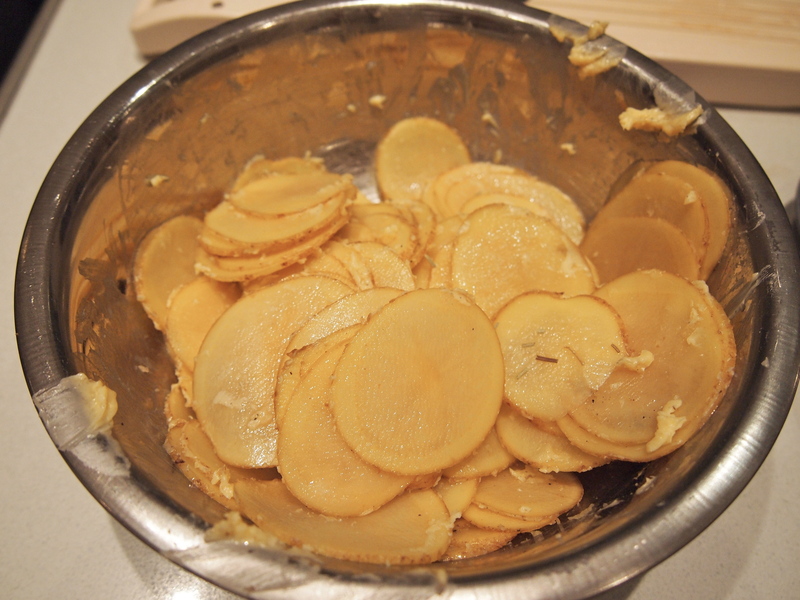 Using a mandolin or V slicer cut the potatoes into very thin evenly sized rounds. Using some of the butter, thoroughly grease a 12 hole muffin tin (it’s important that the tins are well greased otherwise it’ll be hard to remove the potatoes later) and place a little rosemary into the bottom of each hole. Place the potatoes into a large bowl, add the remaining butter, salt and pepper and toss well, ensuring that each piece of potato is coated with some of the butter. 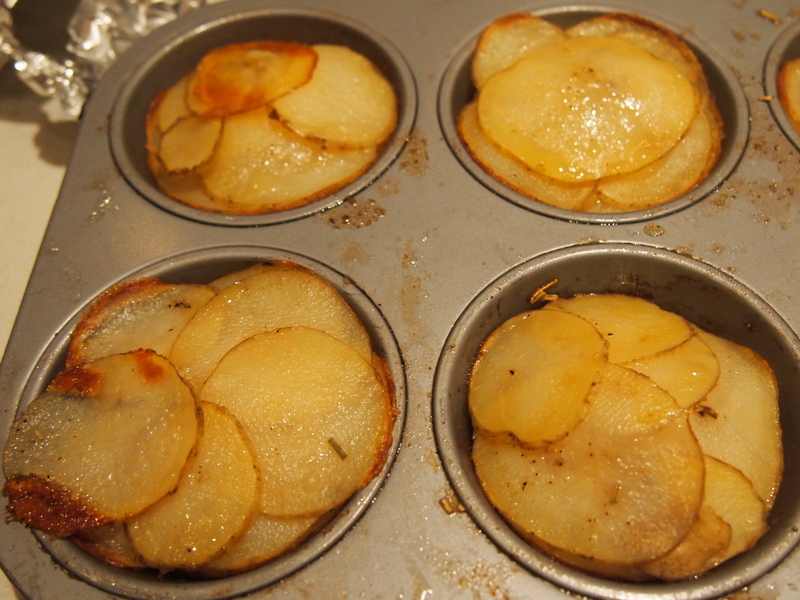 Starting in the centre of a muffin hole form the first layer by overlapping each slice of potato in a circular pattern. Arrange the second layer working in the opposite direction of the first. Continue layering potatoes in opposite directions, pressing down on each layer along the way until pan wells are filled to the top. 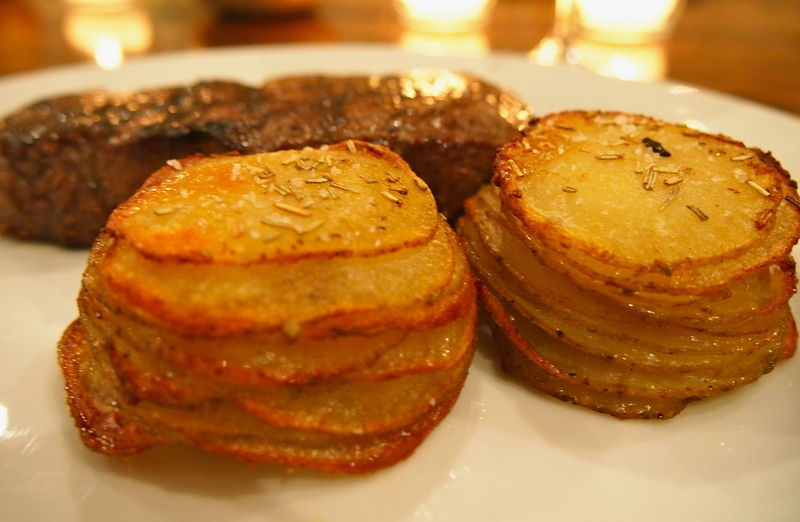 The potatoes will shrink down once they are cooked so pressing down lightly will enable you to fit in more slices. Cover the muffin pan with foil and bake for 30 minutes. Remove from the oven and carefully lift off the foil. Place a baking sheet on top of the muffin tin and carefully invert the tin onto the tray. 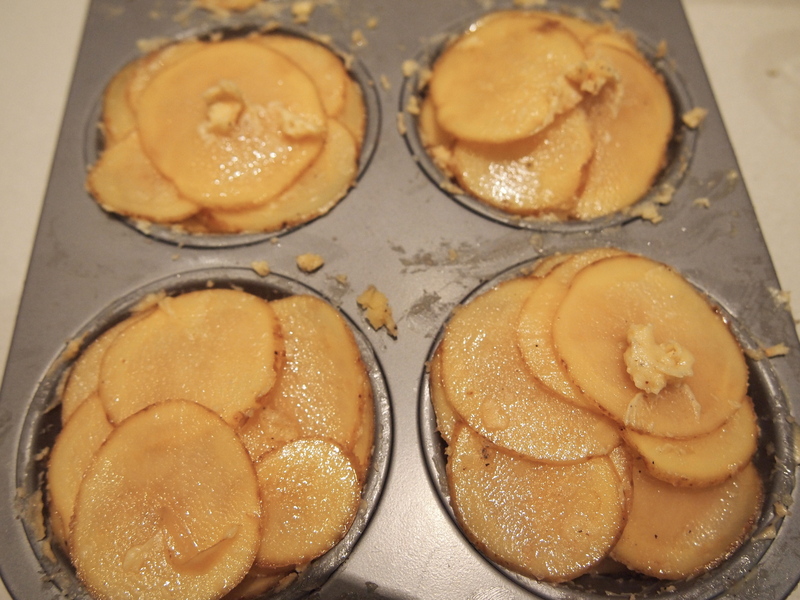 The potato stacks should pop out onto the baking sheet, a few slices may go astray and you may need to reassemble them slightly, which is easily done. The potatoes can be made ahead up to this point and set aside. 20 minutes before you’re ready to serve place the potatoes into a preheated 220C oven for about 15 minutes or until the potato are sizzling and crispy. That look’s so delicious and perfect with the sirloin I think I can see in the background.